Aleksandr Mikhailovich Rodchenko. Russian artist, sculptor, photographer. One of the founders of constructivism and Russian design. Rodchenko was married to the artist Varvara Stepanova. Rodchenko was one of the most versatile Constructivist and Productivist artists to emerge after the Russian Revolution. He worked as a painter and graphic designer before turning to photomontage and photography. His photography was socially engaged, formally innovative, and opposed to a painterly aesthetic. Concerned with the need for analytical-documentary photo series, he often shot his subjects from odd angles - usually high above or below - to shock the viewer and to postpone recognition. He wrote: "One has to take several different shots of a subject, from different points of view and in different situations, as if one examined it in the round rather than looked through the same key-hole again and again." 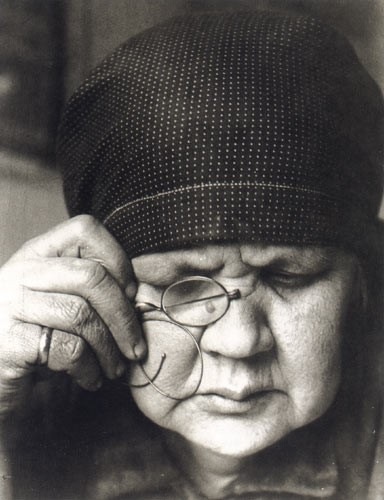 Alexander Rodchenko was one of the most versatile artists in the Russia of the twenties and thirties. Between 1910 and 1914 he studied under Nikolai Feshin and Georgia Medvedev at the Arts College of Kagan, where he met his future wife Varvara Stepanova. In 1914 he moved to Moscow and attended the Stroganov School of the Arts. There Rodchenko met Casimir Malevich and Vladimir Tatlin, and during the years that followed he evolved into one of the leading artists of the Russian avant-garde. He worked as a sculptor, painter, and graphic artist, designed posters for movie theaters, businesses and factories, and designed book covers and furniture. In 1921 his triptych Pure Colors: Red, Yellow, Blue was a masterpiece of absolute painting. Between 1922 and 1924 Rodchenko turned increasingly to photomontages as related to poster art and book design. Especially famous were his illustrations of Vladimir Mayakovski's poetry Pro eto (About This), in which that poet proclaims his love for Cilia Brik. 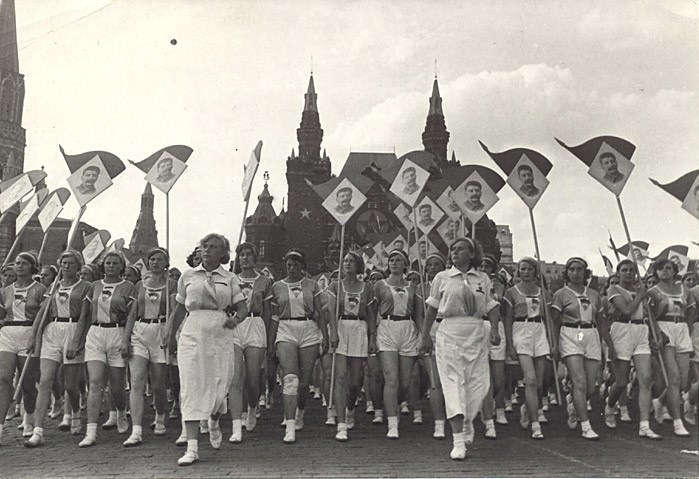 In his montages Rodchenko tried to create a visual image of Mayakovski's verses, thereby creating a unique connection between photomontage and constructivistic form. As he did in his other, earlier montages, Rodchenko used existing photographic originals in Proeto i.e. not photographs he produced himself. Only in 1924, when he was less and less able to find suitable picture material for his montages, did Rodchenko reach for the camera, at last recognizing photography as the artistic medium of his era. Because pictures can be taken with a camera from every position, photography, in Rodchenko's opinion, corresponded to the active eye of man. Therefore, photography was predestined to render, in a representative manner, the confusing impressions to which modern big city dwellers are exposed. By using bold and unusual perspectives, he wanted to liberate photography from conventions and from the standard belly-button perspective and thus he evolved into a distinct pioneer of photographic Constructivism. In 1928 he wrote in his manifesto-like text Ways of Contemporary Photography: "In order to educate man to a new longing, everyday familiar objects must be shown to him with totally unexpected perspectives and in unexpected situations. New objects should be depicted from different sides in order to provide a complete impression of the object." In 1928 Rodchenko, who had given up painting in favor of photography in 1927, bought himself a Leica which, because of its handy format and quick operation, became his preferred tool for his work. This camera enabled him to realize to excess his ideas of unusual camera positions, severe foreshortenings of perspective, and views of surprising details. 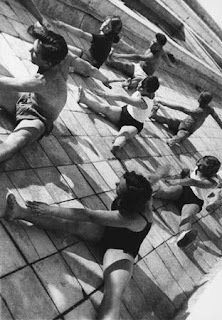 Increasingly Rodchenko's photography was dominated by the artistic element of the line. He liked to integrate elements such as grids, stairs, or overhead wires in his photographic compositions, converting them into abstract constructivistic line structures. Stairs of 1930 and Girl with Leica of 1934 are undoubtedly among the most famous photographs of this kind. in 1930 Rodchenko became a founding member of the "October" group, the most important organization for photographic and cinematographic art of that time. Between 1933 and 1941 he also worked for the journal SSSR na stroike (USSR under Construction) which he had founded together with Varvara Stepanova.